Algoma U’s main campus is located in Sault Ste. Marie, a city of 75,000 people in Northern Ontario. “The Soo”, as locals call it, has all the amenities of a big city – shopping, entertainment, sports teams, festivals, and cultural activities – but without the hassle of traffic. We’re lucky to live in a city surrounded by the great outdoors. With Lake Superior and the St. Mary’s River literally just steps from our front door, there’s always something to do. Come take a closer look. Innovation and growth. That’s what this centre is all about. Officially opening its doors in July, 2011, the new $21.4 million LEED-certified Essar Convergence Centre (ECC), brings together teaching, research and commercial activities in a dynamic atmosphere that fosters innovation and growth. 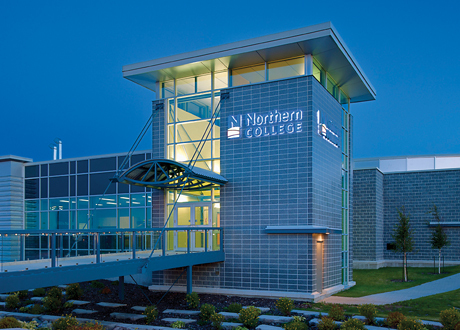 Along with teaching and faculty research labs, established enterprises like the internationally recognized Sault Ste. Marie Innovation Centre help to anchor the facility. Did you know that access to the GLC is included in your tuition? 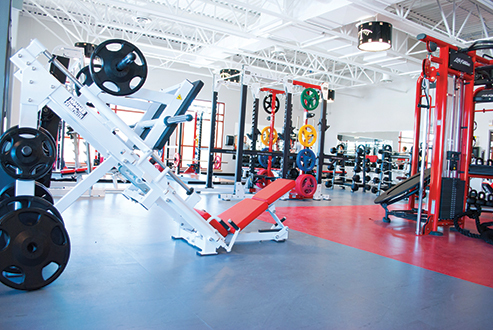 Students can get physical at the George Leach Centre (GLC), Algoma U’s athletics complex. Avoid the freshman fifteen by getting fit and having fun. The gymnasium or field house features three regulation court surfaces, which accommodates a wide range of athletic activities such as badminton, basketball, volleyball, and tennis. One court has been specially designed with a dimple surface for better tennis play. The gym area is surrounded by a 1/9th mile indoor walking and jogging track. The Speakeasy is Algoma University’s student centre and operates as a patio, pub, and entertainment hub. 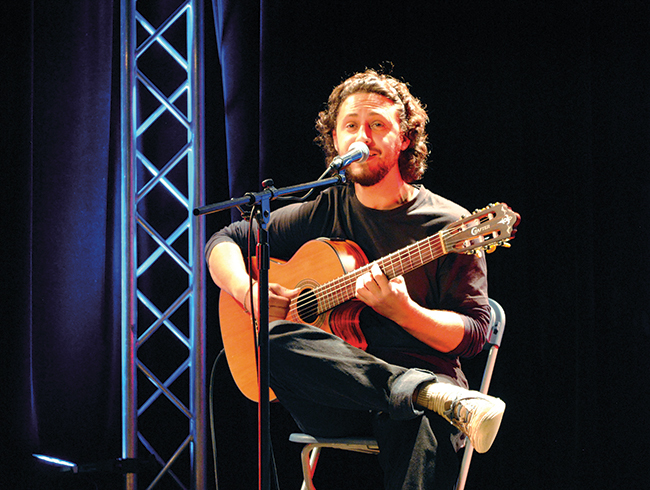 Students can enjoy a place to relax during the day or evening, listen to live bands and performances, study, or participate at planned evening events that happen annually including: karaoke nights, acoustic jam nights and open mic nights , themed thursday pub night, comedy nights, cultural events including EID Dinner, J-Night, and Brazilian Night, etc. It is also home to where numerous special events happen, including presentations, the Algoma University Students’ Union (AUSU) election debates, and pumpkin carving contests. There’s always something happening! Interested in renting the Speakeasy for a special event such as family reunions, rehearsal dinners, birthday parties or showers? If so, check out the Rental Guidelines (PDF) for more information and book your event by contacting info@algomau.ca. 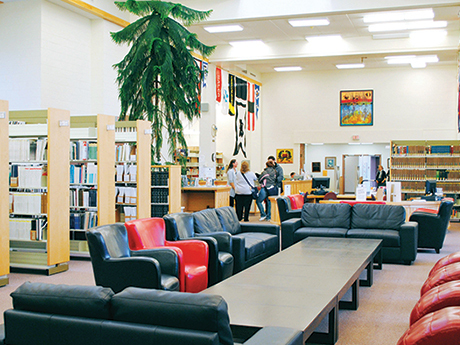 The Arthur A. Wishart Library staff and resources are critical supports for delivering high quality education to Algoma University students and for ensuring student success. The Library is an integral part of the overall academic experience, serving as the access hub to learning resources, and especially through providing learner-centered programs in research skills and information access. Shingwauk Hall, a central and integral part of the Algoma University campus, was first established in 1873 as a residential school for First Nations children, and operated as such until the Shingwauk Indian Residential School closed in 1970. The history and activities associated with Shingwauk Hall are being gathered under the auspices of the Shingwauk Residential Schools Centre (SRSC), allowing the public to become more aware of the vast history and tradition represented by the Shingwauk buildings and site. 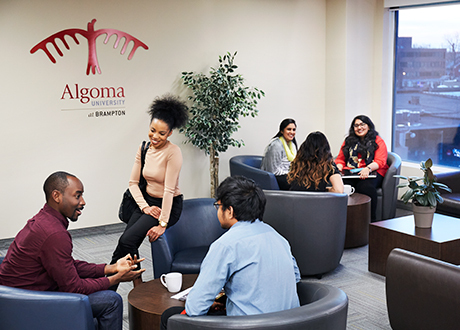 As part of Algoma University’s commitment to providing a respectful, inclusive and innovative educational environment for Anishinaabe (First Nations, Métis and Inuit) students, the University has entered into a Covenant with the Shingwauk Education Trust. The Covenant is a solemn document through which both parties pledge to work together for the furtherance of Anishinaabe education and research. The two partners are following the Two Row Wampum model of development – each partner respecting the other and supporting the other in the pursuit of their goals. 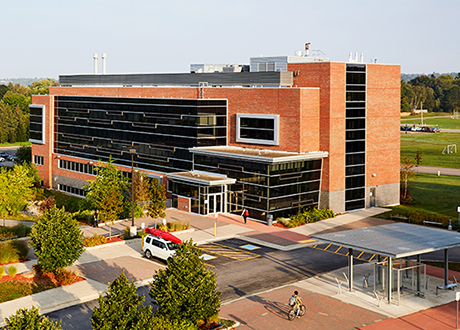 Earn a Bachelor of Business Administration Degree in the heart of downtown Brampton. Enjoy the comforts of home and one-on-one interactions with faculty while earning your degree. Enhance your degree by minoring in Accounting, Human Resource Management, or Marketing. Enjoy the comforts of home while you earn a Bachelor of Arts in Community Development or a Bachelor of Social Work in Timmins. You’ll be making a difference in your community and bringing change to the north.